In the world of football, there are few more fascinating stories than that of the Basque National Team that played in exile. An adventure which unites commitment, activism, identity and suffering along with a fantastic football team. In this case, the sport served as a magnificent loudspeaker, exposing the cause and the suffering of an entire people to the rest of the world. In 1937, months after General Franco’s coup d’état, the war had spread over all the territories of Spain. Lehendakari (President) José Antonio Agirre, former player of the Athletic Club of Bilbao and a member of the Basque Nationalist Party, had the bold idea of forming a selection with the best Basque players to defray the substantial costs that were being incurred to evacuate children while the fascist forces were making their advances toward the city of Bilbao, the most densely populated city of the Basque Country. 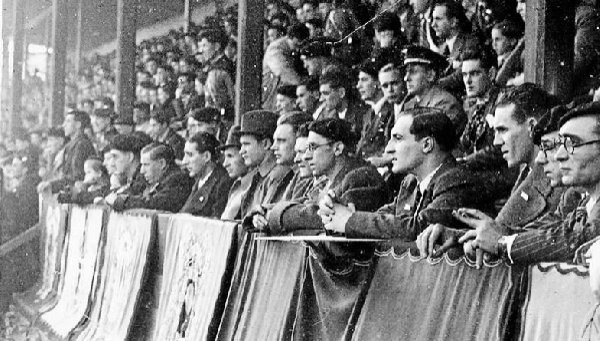 This initiative had a prologue, since San Mamés stadium, the pitch of the Athletic Club of Bilbao, had hosted a match in February, that faced off two teams formed by players friendly to the two main Basque nationalist political groups of the time, the Christian Democrats of the PNV and ANV leftists. The latter won seven to five on a packed field. A month later, they played another game where the PNV-friendly team won. The success of both of these games propelled the idea of the formation of a Basque team to take force for a tour of Europe. At the end of March 1937, they made a public call in San Mamés. With Manuel López Llamosas “Travieso” as coach, in the end, 18 players were chosen of the 25 who came as volunteers. Here is the roster: Blasco, Eguskiza, Ahedo, Areso, Cilaurren, Mugerza, Etxebarria, Zubieta, Barcos, Pedro Regueiro, Luis Regueiro, Emilín, Iraragorri, Lángara, Txirri II, Larrinaga, Urkiola and Gorostiza. The presence of Luis Regueiro was a surprise, since there had been rumors spread by the pro-Franco side saying that he was dead. Finally, there were some last-minute changes, as Travieso did not fill the role of coach and was replaced by Pedro Vallana. He was the legendary coach of the historic Arenas Club of Getxo and Spanish coach at the Olympic Games in Antwerp in 1920, winning the silver medal. Successful people, that was the profile of the members of this team. Prestigious footballers in Spain, genuine stars. Their experience on this Basque National Team converted them into myths, into legends. 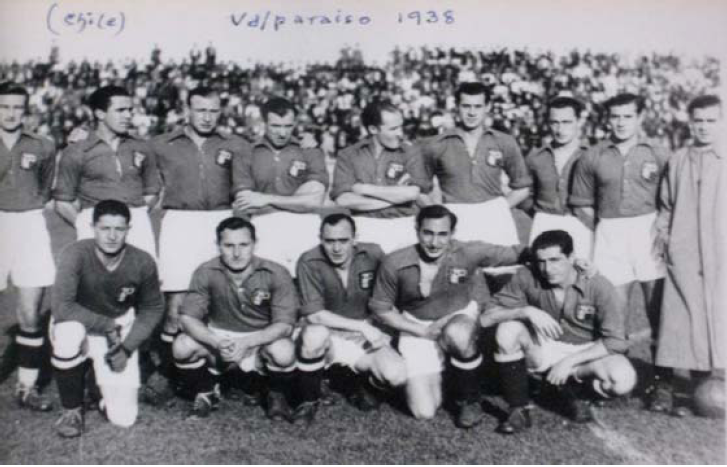 The Basque National Team played its first match on April 25, 1937 against the Racing de Paris Club at the Parc des Princes stadium in the French capital, resulting in a Basque win of zero to three. However, a few hours later terrible news came: that of the bombing of Gernika carried out by the German Condor Legion. The team played 20 matches across the continent, being the ambassadors of a people who suffered the ravages of fascism shortly before the suffering would be felt first-hand all over Europe. In the Soviet Union, where the Basque National Team enjoyed great success, they faced off against the Dynamo of Kiev and Moscow’s Spartak. Then in Poland, after an initial hostile reception, the perception changed with many players seen praying. National teams such as Czechoslovakia, Norway, and Denmark also played against the Basque selection. Against the Danish team, the all-star team led by Pedro Vallana, won eleven to one. They ended up with fourteen wins, four draws and two defeats. However, that falls into the category of post-fictional texts, since, instead of setting off to the World Cup in France, the Basque National Team took off for Latin America. It was not an easy decision, since it meant leaving everything behind, family and country, to be the international representative of a people that was suffering a major repression. Before leaving, after the fall of Bilbao, players Roberto Etxebarria, Gorostiza and the masseur left the team. The rest ventured off into the unknown, but convinced about what their efforts meant. Despite the interest of the big Argentine teams, including Boca Juniors and River Plate playing against the Basque team, FIFA created massive obstacles for playing matches there. So, they ended up playing in the Mexican League, and managed to end up second in the standings. It was an absolute success, filling stadiums and leaving an important sports legacy. 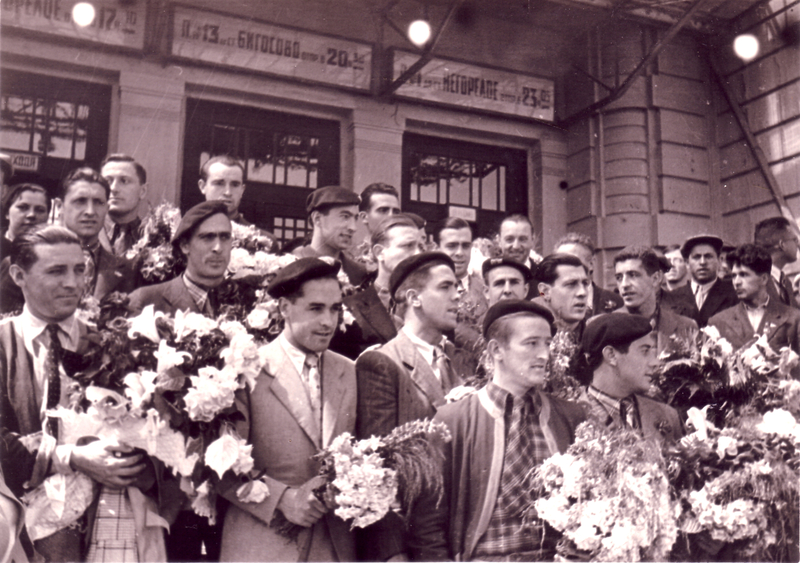 The political situation in the Basque Country was increasingly more complicated, in the midst of the triumph of Franco’s troops throughout Spain. 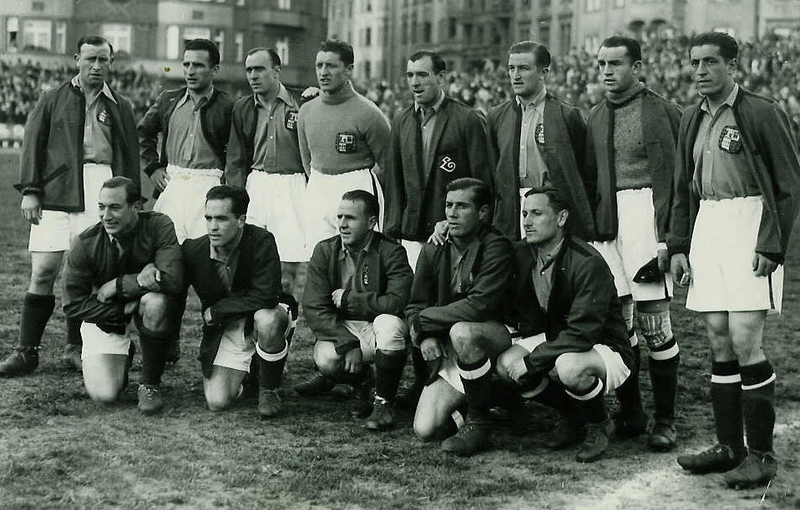 The Basque National Team lasted until 1939, playing matches in Cuba and Mexico, with additions such as the exiled Catalan Martí Ventolrá, until the team was finally dismantled. The team’s sports legacy and symbolic meaning as a group is enormous. On an individual basis, many players continued their careers beyond the national team. For example, Zubieta, Lángara or Iraragorri are true legends of the San Lorenzo de Almagro team of Argentina. The first two were on the cover of the prestigious magazine “El Gráfico” and today Lángara boasts a mural in his honor under the inscription “the Basque.” And, Blasco and Cilaurren played at River Plate in Buenos Aires as well. Txirri II moved to Uruguay while Luis Regueiro (former star of Real Madrid) settled in Mexico and after playing three years with the Asturias FC, left football. His relationship with Mexican football was extended through his son, a member of the Mexican National Team which played in the 1970 World Cup, with Ventolrá’s son as a teammate. It took 40 years for the Basque team to play a game wearing the green jersey and carrying the Ikurriña (the Basque flag). It was not worn until 1979, against Ireland, and with very well-known stars like Iribar, Arconada, Zamora, Satrustegi or Dani. It was in the framework of the Bai Euskarari festival, in favor of the Basque language. They were the heirs of an extraordinary team, of a group of people who went into exile as ambassadors of an entire people. The Basque team that visited the world enjoys a favorite place in the collective imaginary of society, an example of dignity. Much more than sports heroes, whose goals and triumphs represented acts of resistance against fascism, bullets, bombs and repression. Note from the Editor: Basque Tribune has commissioned and published this article at the request of reader Iker Urquiola, the son of one of the players who formed that mythical national team. We thank Mr. Urquiola for his initiative because now this fascinating story can become more well known. 3 Comments on "The Sports Embassy of Basque Exile"
Up until now, when we wrote about this sport we have used the term soccer. We were drawn to this due to the fact that many of our readers are from the United States of America. But in response to a number of concerns and recommendations we have decided to use the word football from now on, which is much more widespread throughout the rest of the world. In addition, we believe that our readers of the USA know perfectly well how to distinguish both sports, despite the terminology used. Thank you for your understanding and we hope that this change of criteria does not pose an inconvenience to anyone. El equipo Euzkadi fue una iniciativa del periodista bilbaíno Melchor Alegría y no del Lehendakari Agirre. En la convocatoria para la gira europea no estaban ni Txirri II, ni José Manuel Urquiola que sí embarcaron en octubre de 1937 a América. 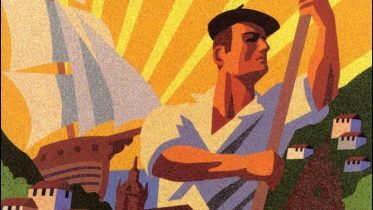 El partido celebrado en el Parque de los Príncipes de París no se disputó el 25 de abril de 1937, sino el 26. Txirri II , durante la estancia de la Selección en Argentina, se quedó en Buenos Aires y no en Uruguay. En este país sí se exilió Pedro Vallana. En Argentina también abandonó Pedro Areso.